As supporters of the School Food Plan we are dedicated to helping children develop a healthy eating lifestyle and to ensure they get the necessary energy and nutrition they need across the school day. We do this by helping children know which foods will help them develop as well as which will help maintain concentration levels in the classroom and stamina on the sports field. We also work hard to ensure we provide a nutritionally balanced value for money meal that children want to eat. We believe that it is important that the food we offer, looks good, tastes delicious and satisfies the developing palates of children and young adults. We only use fresh ingredients, sourced from the right suppliers which are in season and British, where possible. We don’t use salt in our cooking methods at all, and reduce the sugar content wherever possible in all recipes. All homemade desserts contain fruit. The focus of our menu development is on quality and variety. 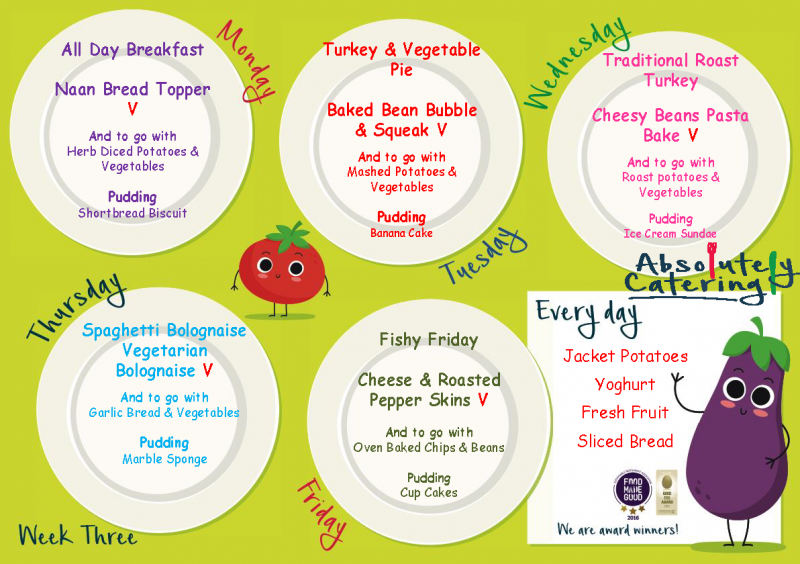 Our menus are designed to be attractive and appetising and adapt to the eating habits of growing children. Using only the freshest ingredients, dishes are cooked from scratch. 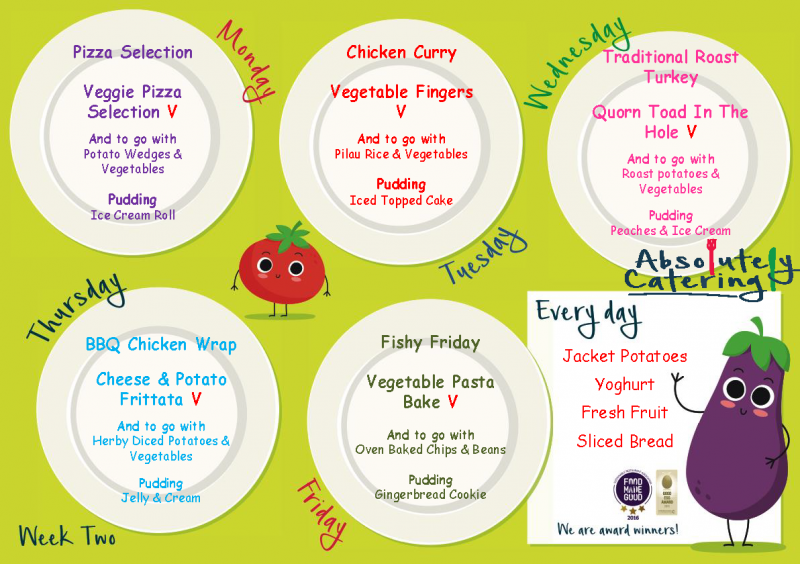 Pupils can choose from two varied hot main meals, one of which is meat free. We also have jacket potatoes and a selection of sandwiches, fresh fruit pots, yoghurts or raisins plus freshly made cakes. 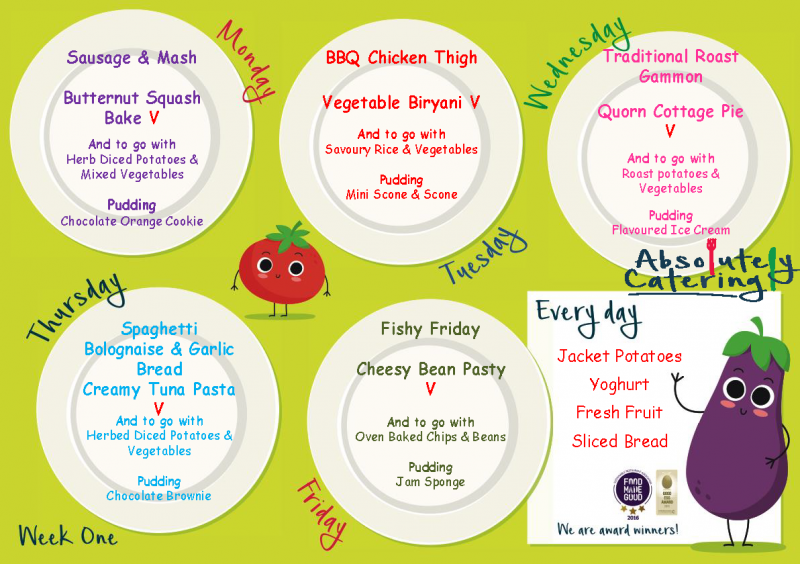 Our Main Meals include protein, carbohydrate & vegetables as part of a well-balanced meal. Further information about ABsolutely Catering can be found by visiting the school caterers website. We are currently working towards achieving the Healthy Schools Award. This is a country wide programme which focuses on the links between, healthy eating, physical activity, social and emotional education and emotional well-being. St Oswald’s Catholic Primary School, aims to promote healthy living for all members of our school community. Our children follow the SEAL programme which supports their social and emotional development this involves the development of their social awareness, the management of feelings, motivation, empathy and social interaction. The children are encouraged to explore themes including, New Beginnings, Getting on and Falling out, Anti Bullying and Friendship, Going for Goals and It’s Good to Be Me. Our families are included in our aim too. We offer the opportunity for our families to join us for focus days and events. We share coffee mornings and afternoons with themes and special focuses covering a variety of subjects including, Healthy Living, Healthy Eating, E-safety. We invite our families to join us in our after school clubs supporting their children and developing new skills too. Parents, carers, grandparents are invited to join their children for dance sessions, practical maths sessions, guitar lessons and singing in our choir.